I started turning about 10 years ago and was puzzled that carbide was not used in turning tools. At the time I would touch up my steel turning tools every few minutes because I liked the feel of the sharp tool. I found some carbide cutting bits for metal lathes and shaped them to match my steel tools. I was very pleased to find I had a tool that would last for an entire bowl turning. When I would mentioned this to turners I ran into I got a dismissive response. ‘This was a scraper’ or ‘you can’t get as good an edge’. Neither matched my experience. I had to give up turning for 5 years and have just got back at it. Now carbide tools are readily available. I read everything I could on the carbide tools and came to the conclusion that the commercial carbide tools are very different from those I made. The commercial ones are flat discs or other shapes supported by a steel holder. These present a knife edge to the turning wood and generally allow for a scraping action. The ones I made are similar to a steel bowl gouge in the cutting edge shape. This facilitates the ability to get a cutting action from the tool. As for the sharpness of the tool, I’m sure the steel is sharper but not for long!. So perhaps the evaluation of carbide tools should include the shape of the cutter rather than just the material it is made of. This is only my experience but it explains to me the profound difference between my experience and what I was reading. Any thoughts? What did you use to grind the carbide? Any special tools jigs or set ups? A bit slow, but I just used the cheap diamond hones that I had picked up at Princess Auto. By hand, by eye. I have both, use both, like both. With no pictures didn’t happen. Biggest draw back to carbide steel is cost and need to replace when can no longer sharpen. True most commercial carbide tools are scrapers but that’s okay for somethings turners turn they cannot be beat. Talking about dense antlers, exotic woods, bone or stone. Yes carbide scrapers are okay for what they can do but don’t think will ever completely replace conventional turning tools. Not sure average turner has time or money to make their own cardbide gouges, but prehaps some company will start making them some day. 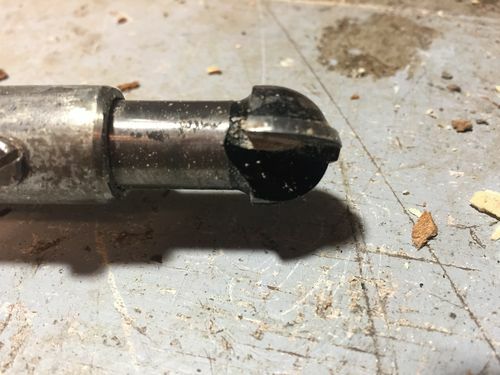 This is a very nice carbide router bit that worked right out of the box. 2 edges is a bonus. A little tricky to use so takes full attention. Very good on the inside of bowls that have a smaller opening on top. Carbide used to turn wood will always act as a scraper. Carbide, being a very brittle material cannot hold a knife edge. When carbide is used in metal machining, it relies on high speeds to attain mirror finishes. Scraping and cutting is really the same thing. The difference being in the angle between the tool and the work. HSS tools can be sharpened to a very acute angle, but can’t work at the same speeds carbide can. Carbide is ground at a much less acute angle and so the edge holds up better without fracturing. There are also many different grades of carbide, but sharpness is a trade off for strength. I’ve used carbides out of the box and they do not cut as cleanly as gouges but they do well enough that it’s just a little extra sanding. IMO, gouges cut cleaner and faster. The only real advantage of carbide is it stays sharp longer and has very shallow learning curve. I like carbide for roughing very hard woods, saves sharpening. MrRon, this is where my inexperience comes in. I just assumed that since a continuous shaving comes from my cutting edge that it is cutting not scraping. But since I am using carbide I must be scraping. Regardless of the steel used to make a tool you can get shavings when scraping. Reed Gray shows how his big ugly tool for example. More than anything depends upon your skill and wood you are turning more that tool steel. Can remember when carbide cutters being talked about on diferent forums by wood turners looking for the perfect tool. Yes in early days carbide router bits one type of cutter used by turners. Those discussions got technical but most turners had a wait & see attitude back then. Few guys were selling their carbide tools with various cutters via word of mouth. Wasn’t until vendors got into selling them and mass marketing by Hunter & guy from Easy Wood that saw carbide tool selling briskly. By then also had and still have guys buying cutters and making their own tools. Do carbide tools live up to all the hype? Answer is both yes and no. Yes the learning curve is not that difficult, and appeals to turners that don’t know or want to invest in sharpening systems. Down side is replacing cutters once dull. If buy in bulk prices of cutters not that bad, have to shop around. bone, exotic dense hardwoods, and stone. While not perfect this testinG of various turning tool steels very interesting even though did not use carbide cutters in their test. You can read and decide for yourself. Biggest point should take away from the testing is found in two sentences. No matter what steel is used to make your turning tool, need to sharpen when dull. As a machinist by trade I have probably used more carbide than many people, but it was mostly on metal. I have used it quite a bit for wood. The two biggest things about carbide and wood are that it cost more and it stays sharp longer…that’s really about it. It will cut and it will scrape either way, wood being so much softer. From what I see in regards to using it for a wood lathe tool, it all comes out in the wash. You can spend the money and move on with the project or you can spend the extra money as time stopping to sharpen your lathe tool. It’s really the special uses that make the difference. Turning very hard wood or materials or wood that has a lot of minerals and “sand” in it could make it necessary. Same with metal…it’s just harder so it is used to machine very hard metal. I can tell you that with metal it does not like an interrupted cut and will break easily. For cutting metal it does not like high speed either. Most things machined fast out of metal are done with CBN tooling and have been for some time now. I would use carbide for rough turning and HSS for finishing as HSS will yield a finer finish. Wildwood, thanks for the reply. Very interesting about Reed Gray and the myrtle wood turners! I would try one of his ‘big uglies’ but the cost of the Tantung is a bit steep and hard to source. I have never had to pay much for my carbide bits. Not more than $10 and easy to buy. Thanks to all the replies. You have helped round out my understanding of the facts and myths surrounding carbide, cutting and scraping! Ginasdad: Anyone who says that carbide on wood will always act as a scraper is mistaken. If you look at Mike Hunter’s carbide cutters, for example, they are not the flat piece of carbide used by companies like Easy Wood. Mike’s are a dished carbide cutter, with which you can ride the bevel and take cutting shavings, not scraping shavings. In fact, Mike’s tools do not make good scrapers at all. There are other tools similar to Mike’s; they use dished cutters also. You can look on Youtube for videos of John Lucas demonstrating Hunter tools to see that carbides are for more than scraping. It is not unreasonable, therefore, to believe that your tools may be capable of more than scraping. I would like to see a picture of the tools/cutters you made to see if that is the case. If you use a carbide scraper on a green wood you’ll get a nice ribbon coming off the tool. If you use it on kiln dried wood you’ll get a stream of chips off the tool. That’s my experience anyway.